Police, though amused by the costume, are treating the incident as a serious crime. SAN DIEGO, Calif. (KTLA) -- 'Gumby' may be sent to the pokey after he was caught on camera trying to rob a convenience store in the San Diego area. The bizarre robbery attempt occurred after midnight Monday at a 7-Eleven store near Rancho Penasquitos, KGTV reports. Surveillance video shows a man, dressed as the TV character 'Gumby,' entering the store with another man and approaching the clerk. Initially the costumed man asked for a pack of cigarettes but then told the clerk, "This is a robbery," the station reports, adding that the clerk responded, "Come on man, don't waste my time. I have things to do." The Gumby impersonator claimed he had a gun and then began fumbling with his costume as if he were trying to pull it out. Police say the video is amusing but they're taking the crime very seriously. "It (the costume) could have been a ski mask. It could have been a bandana. It could have been a hoodie. 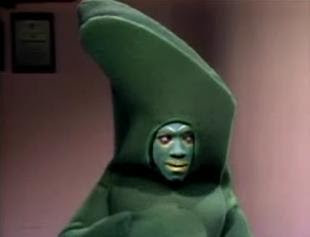 It just happens to be a Gumby costume," San Diego police Detective Gary Hassen told the station. 'Gumby' dropped some change during the incident, and the clerk reportedly helped him pick up the coins. The suspect, who apparently did not take anything in the ordeal, was seen leaving in an older-model white or light-colored minivan. A reward of up to $1,000 is reportedly being offered in the case. Anyone with any information is asked to call San Diego Police at (619) 531-2000. Police think "Gumby" gained access to the convenience store by sliding through the crack between the doors. The blockheads framed him, what assholes.